Virginia Rathbun, a recent satisfied DustRam customer, has agreed to let us interview her about her experience with the DustRam® System Equipment. If you are reluctantly living with outdated tile because you fear the mess, stress, and health hazards of tile removal, this interview is for you. Virginia, you had a very unusual tile removal situation. Can you elaborate on that? I didn’t know I had any tile to remove. My kitchen and bathrooms had neutral 19×19 tiles that had been installed right before we purchased the home in 2010. The rest of the rooms were carpeted. We decided to replace the carpet in the AZ room with tile. When we pulled the carpet up in one corner we found an ugly surprise—dated blue tile. What was your first thought when you saw the tile? I suspected more [tile] was hidden under the rug in other rooms, and I was right. Part of the living room and the hallway leading into the bedrooms were tiled. Unbelievably, the living room tile was a different size and color from the Arizona room that was open and adjacent to it. It was a nightmare. There was no way I could live with it. I was now envisioning a big mess in my house, a big hit to my wallet, and an asthma attack. Yes, the dust in the valley is irritating enough; with airborne dust from ceramic tile I was guaranteed an asthma attack and months of prolonged coughing and wheezing. Did you think you would have to leave your home for the duration of the removal and for a time after? I thought setting it on fire and collecting the insurance was a more appealing idea. Well, no, but seriously… I thought I might have to leave for several days at least. Did you ever think of removing the tile yourself? My husband ventured into Home Depot and bought a couple of basic tools an employee recommended. I think he was more curious than serious about attempting it and just wanted to see the difficulty level on a scale of 1-10. What level of difficulty was it? An 11. He was done after two tiles. We quickly moved on to plan B. Some friends suggested hiring some college students looking for work. It didn’t. That plan lasted about two days. At least our education in removing tile was evolving. I realized that breaking up tile was potentially dangerous. If you’re going to just bash it up, it will fly everywhere. Protection is needed for the face, the lungs, etc. I didn’t want anyone to get hurt, nor did I want to be liable for that. The next step was clearly to hire a professional. How did you go about finding a contractor? What led you to Jack King? I went back to the Internet and started googling “tile removal” with tags like clean, no-dust, whatever I thought would lead me to the cleanest, most professional service out there. I quickly found Jack’s multiple websites. I was impressed by all the videos and information about his DustRam® System Equipment service, and the guarantee of dust-free tile removal. So I made an appointment for the hour-long consultation. In fact, he spent extra time with me—close to two hours—explaining his DustRam® System. There was no question he didn’t answer. How much tile had to be removed? Around 520 square feet. Jack also assured me that his measurements were precise. There was no sloppiness or dishonesty, and having these measurements prior to dealing with tile installers was very helpful. 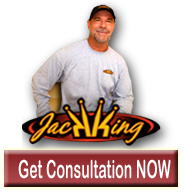 What convinced you to hire Jack King? He was the most professional contractor out there… his demeanor, his presentation, his references. When he told me he didn’t need to hang any plastic or cover my countertops, I was sold. I also liked the idea that Jack wanted to meet with my tile installer to consult with him about the concrete after the tile was up. I thought that was going the extra mile for me; it guaranteed I would not have to pay additional money to an installer for any further concrete repair or leveling. Did you need extra concrete leveling? [I needed] very little. However, Jack explained that the concrete in AZ is often soft, and if the tile is not removed properly, it can get damaged, leading to considerable expense to fix. Tell me about the day Jack came and removed the tile. What most impressed you about Jack and his crew? His crew came on time at 7:00 a.m. My garage quickly filled up with industrial strength vacuums, buckets, hoses, etc. When I saw the scope of the operation, I knew my home was in good hands. Never have I left my home with working contractors in it. However, the crew was so professional and organized—going right to work, setting the equipment up, and taking up the tile—I felt free to leave and come back later. When did Jack finish the job? When I returned around 1:00 p.m. I think most of the tile was up and they were removing the thinset. The machinery that accomplished this part was so clean I didn’t notice any dust escaping into the air. After that, they vacuumed. Everywhere. They were completely finished by about 4:30. Did Jack really leave your home cleaner than it was when he started? Oh yeah. Not only did he vacuum every inch of the concrete, but he also vacuumed my countertops and my blinds. He even removed a layer of dust I had on the top of my refrigerator and the blades of my ceiling fan! Yes. If you pay for the cheapest contractor to remove the tile but wind up with a mess or damaged concrete, you just put that savings and more right back into repairing the concrete. The expression, “you get what you pay for” comes to mind. What do you think are some misconceptions about the process of tile removal? That it is a simple job that anyone with a few cheap tools can do… and that it is an unavoidably messy job. I mean… it’s not just tile. It’s also thinset [removal] and leveling concrete. There is nothing simple about doing all this dust-free and without causing damage. But Jack has his equipment and method down to a science. And because of that it can be done without a mess. I also think it’s easy to underestimate how invasive the dust is without the right equipment. It will wind up everywhere, even inside closed cabinets! Would you recommend the DustRam® System Equipment service? Why? Unconditionally. I don’t think it’s worth any amount of money to compromise your health. Even if you don’t have allergies or asthma, the dust particles are potentially irritating and toxic to inhale. Another thing… I waited until October to renovate because I feared putting on the air conditioner. But the whole process is so dust-free, you can keep your air on without dust blowing all through the house. In Arizona where we have endless summers, that’s big! And it was such a relief to have it all done in one day, and never experience the slightest inconvenience beyond the obvious, like moving furniture out of the work area. Otherwise, nothing to clean, no damaged concrete to shell out money to fix, no lingering dust to aggravate my asthma. One last question: How do you like your new tile? It looks great… and it increases the value of my home! We thank Virginia for allowing us this interview. We value our customers and appreciate their taking the time to give us detailed feedback.